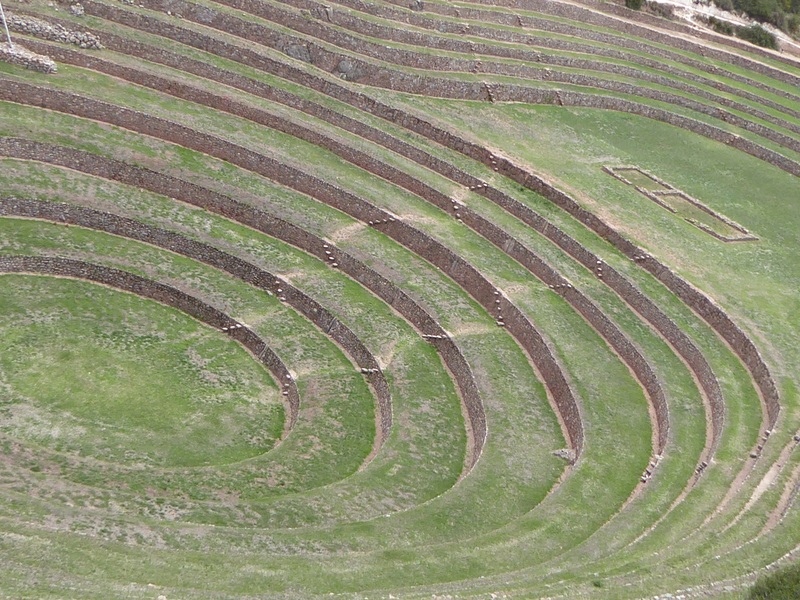 I’ve been in Cusco, Peru seven days now. The first few days I just wandered around the city. I’ll give you my impressions of it in the next post. 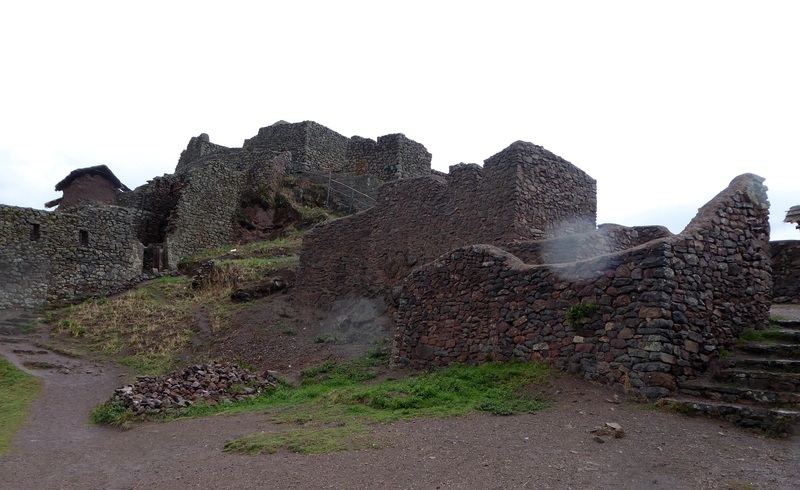 But this last Friday and Saturday I took two day tours to see a few sights outside Cusco. 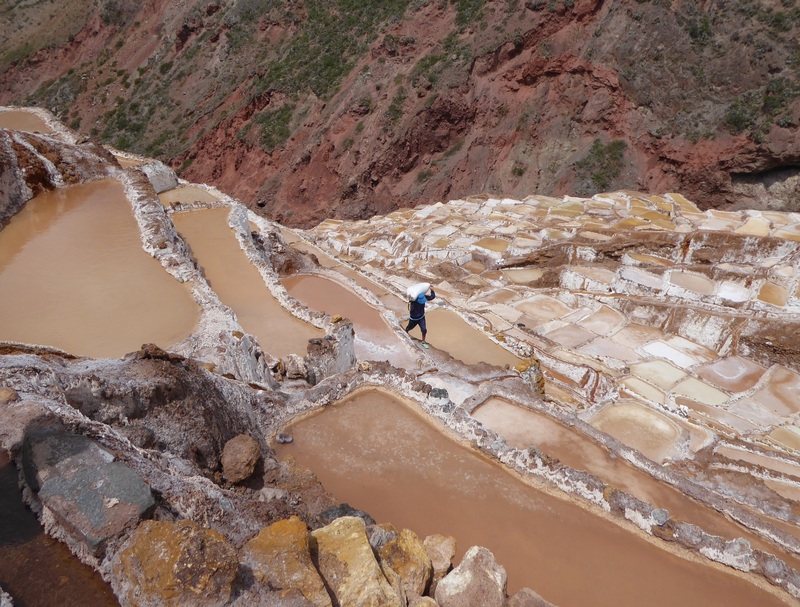 The tours were fairly inexpensive …. and perhaps I should have kicked out a bit more money for them. I saw some beautiful sights, but it was rushed and I didn’t see as much as I’d hoped to. Part of the reason, I believe, that it was so rushed was that there were frequent stops at craft markets. I very much appreciate helping the local economy, but I’d hoped to see the sights a bit more and there was nothing mentioned in the brochures about stopping at so many markets. Ah, well. Anyway, here are a few pics from the first market. This gentleman was modeling a shawl for me. It’s hard to not buy everything that someone is trying to sell you. I appreciate the effort and, like I said, I do want to support local economies, but I can’t buy very much. But…. I did buy a skein of Alpaca yarn and I can’t wait to knit with it. Okay, goofy and hokey, I know. But, hey, how often do you get to hug a llama? 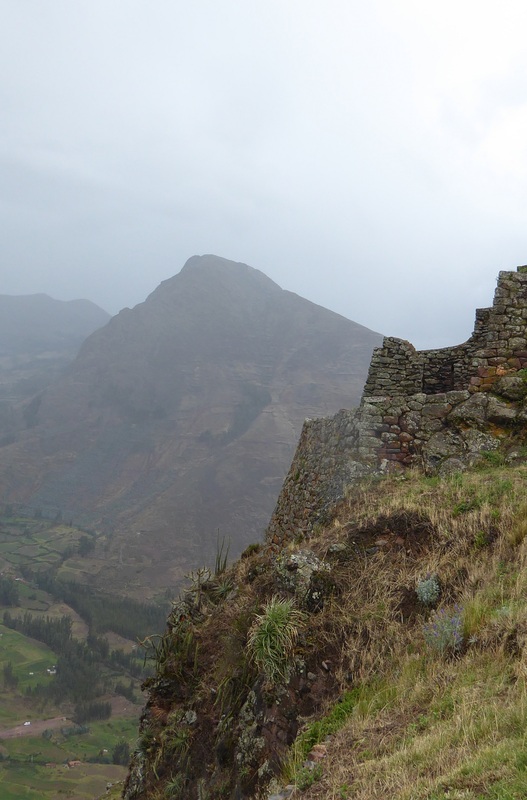 From there we drove to some Inca ruins outside of Pisac. If I ever get the chance, I will return there. I didn’t realize how beautiful the area was because we stopped in the heart of town at another craft market…. where, by the way, I ate the most delicious corn ever! 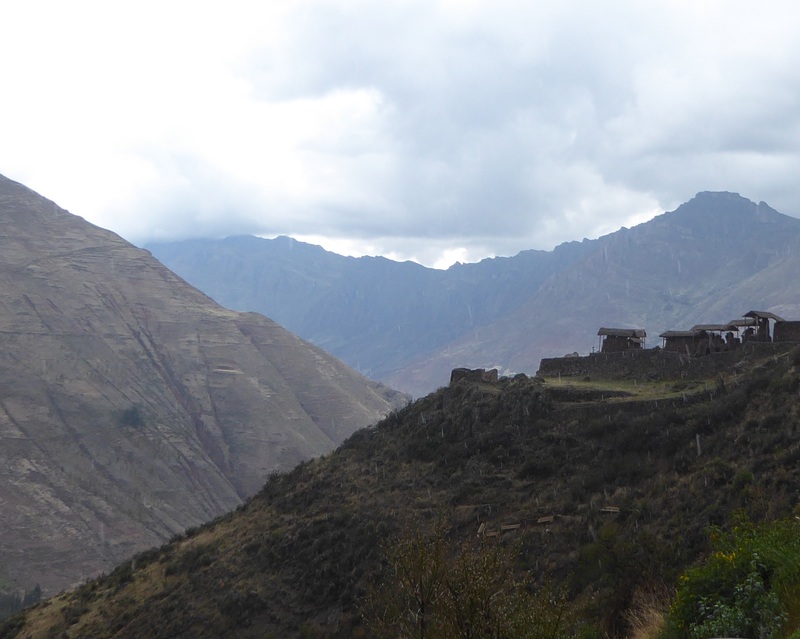 But, once we got back on the road and drove through the rest of Pisac, I saw the most lush, green valley I may ever have seen. I think absolutely anything would grow there. Of course, by then I was in a bus on a bumpy, windy road and couldn’t take pictures. 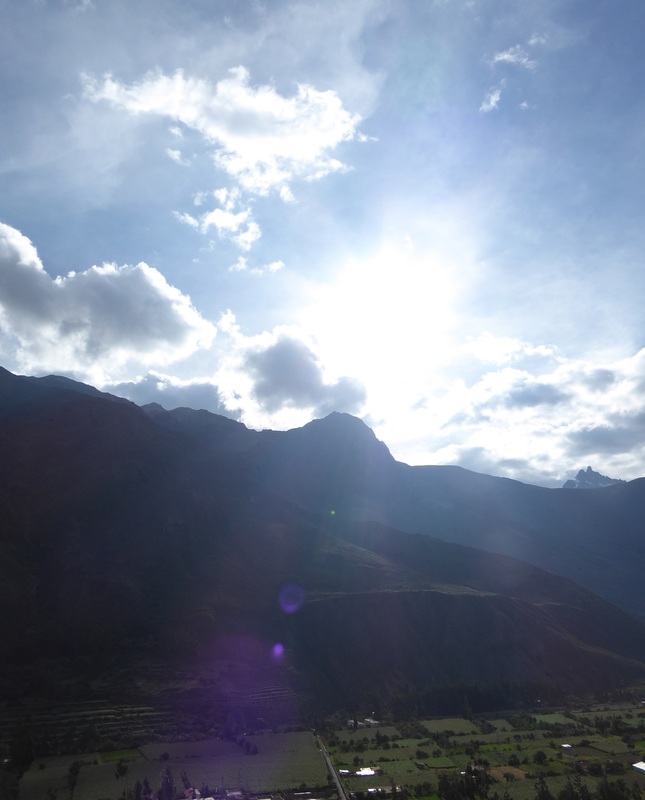 It’s no wonder they call this area the Sacred Valley. But, I’m getting ahead of myself. First, the ruins. Rainy season is coming on and in fact, it did rain a bit, as you can see on my camera lens. But I like rain, so no problem for me. We stopped for a very quick lunch at a small town. 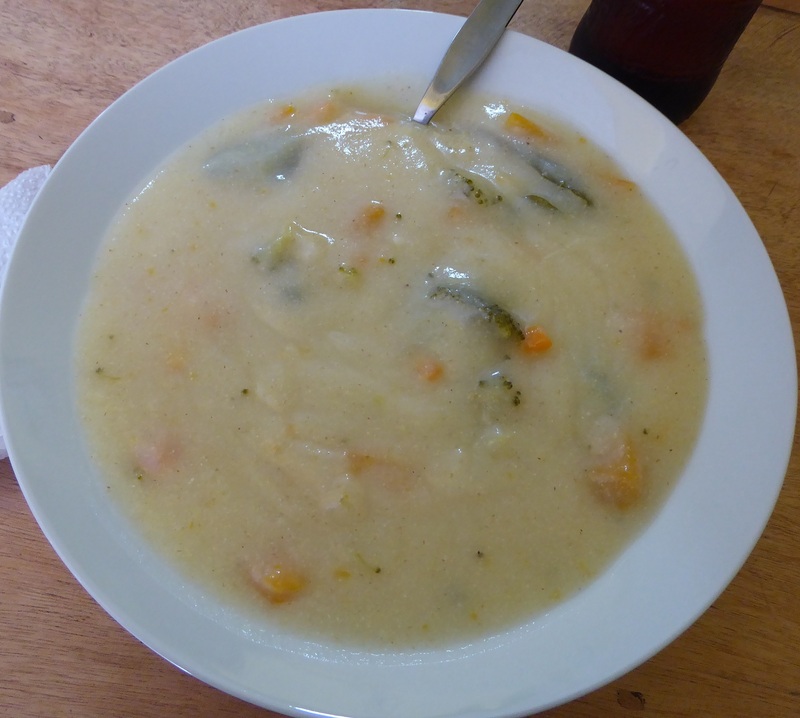 Most of the group went to a buffet but I and a friend I’d met recently at a hostel went to a small restaurant and had the most scrumptious cheese and potato cream soup. 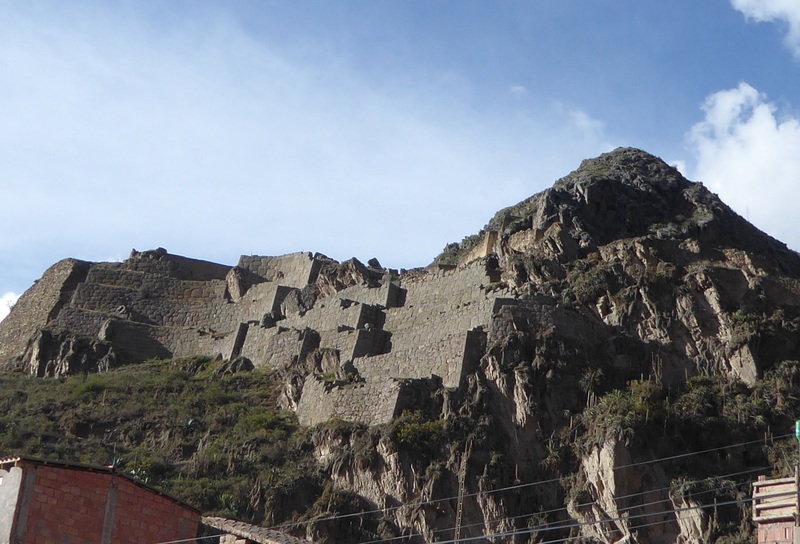 On to Ollantaytambo (more Inca ruins). A view from the parking lot. Here’s a water channel that runs through the town as you walk up to the ruins. The steps. The guide said there were 250 of them in this particular location (not to mention the jillions you take everywhere else!). I steeled myself to climb them. Given time, I think I could’ve and I really wanted to. I wanted to see the view from the top. But, time constraints intervened – gotta get to those craft markets, ya know! 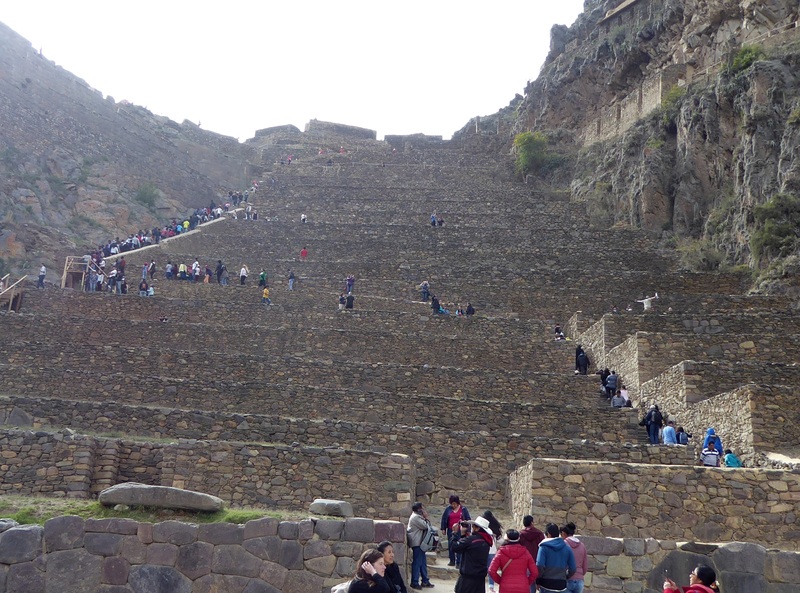 There was never any intention for the group to scale the steps, apparently. We’d only gone up two of the large platforms before she led us back down. Sorta disappointing. 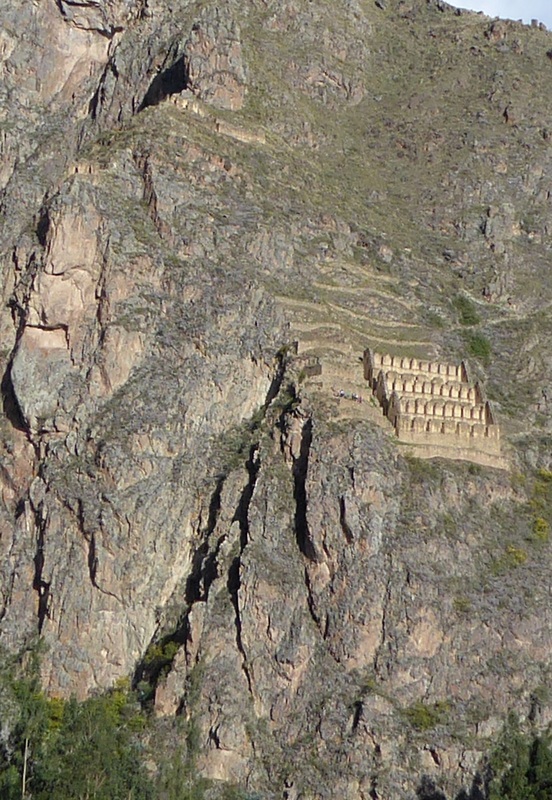 These housings built into the side of the mountain were incredibly intriguing. 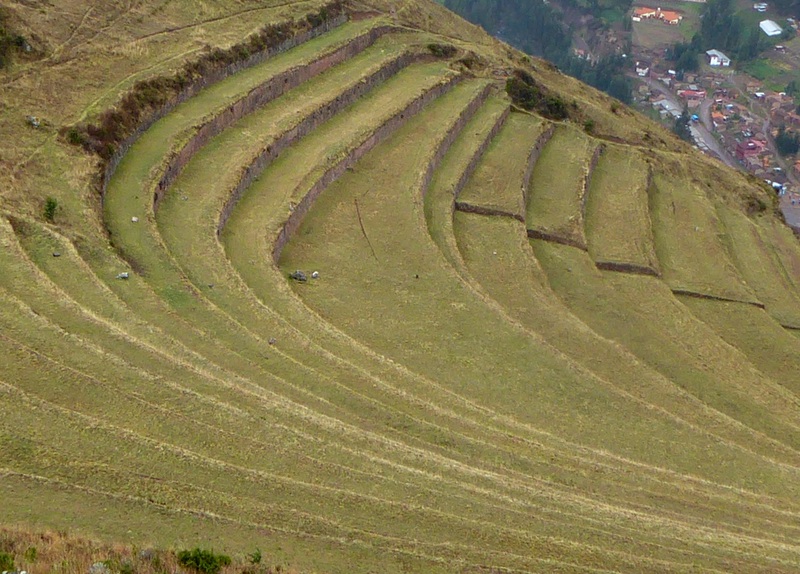 The ingenuity of the Inca is astounding. 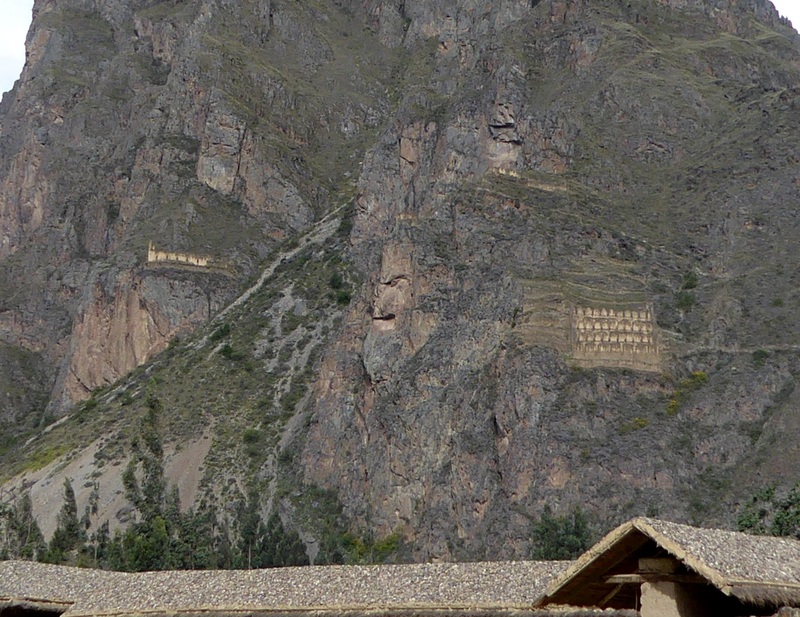 Examples of Inca craftsmanship in stone cutting (click on the pictures to see them individually). A couple views from as high up as I could get. My new friend and I (Angela from Italy, by the way) were both so intrigued by those housings in the side of the mountain (which turned out to be storage rooms for food, amazingly enough) and disappointed in not being able to climb to the top of the stairs, that we broke from the group (such rebels!) to try to get a better view and this is what we saw. Notice at the left the rock formation that looks like a face. It was considered to be a king of the mountain. 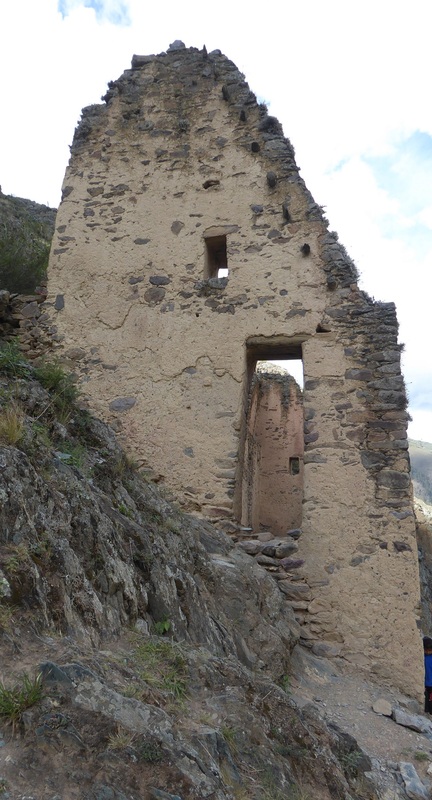 There was what seemed to be a remnant of one of these housings that we saw when we climbed up higher. But what made the journey back up the mountain more than worthwhile was this next picture. These lovely women were so happy and giggly, it was infectious! Another woman came after these three and asked for my picture with her. So, somewhere out there, there’s a picture of me with her, arms around each other, head leaning to head and smiling very happily. 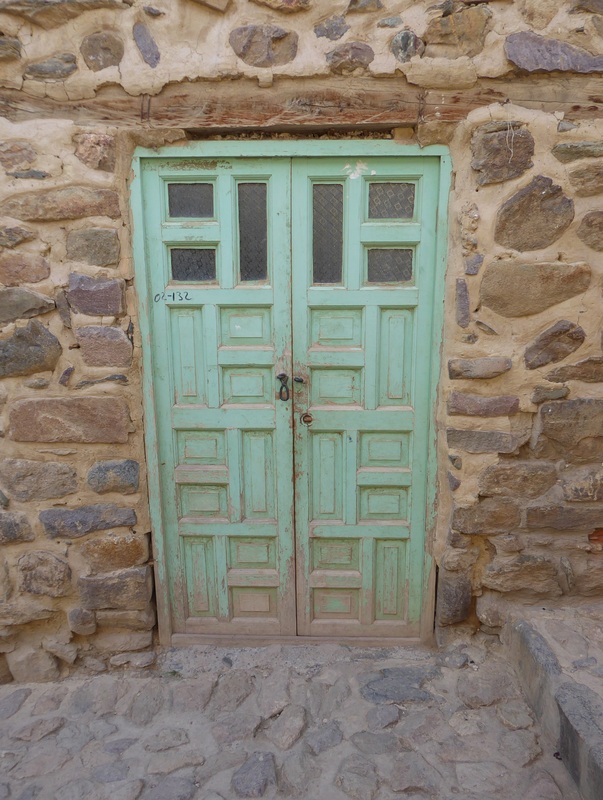 (If you haven’t been following this blog, I have rather an obsession with doors). 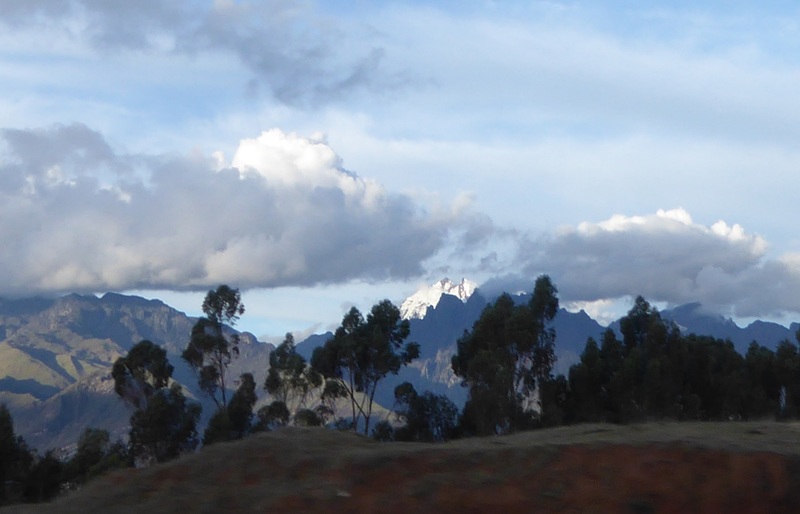 A view from the bus of the snow-capped Andes. 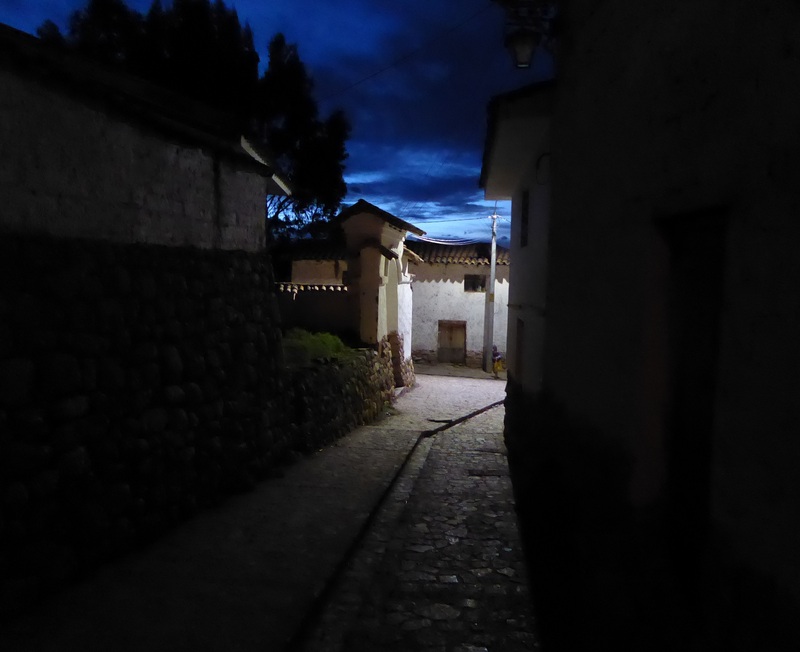 Nightfall in the last town we stopped at that first day. Day 2 – the day I looked forward to most. I took these three pictures from the bus, hence the window reflection. They were celebrating a day of dancing. I think we should all do this. 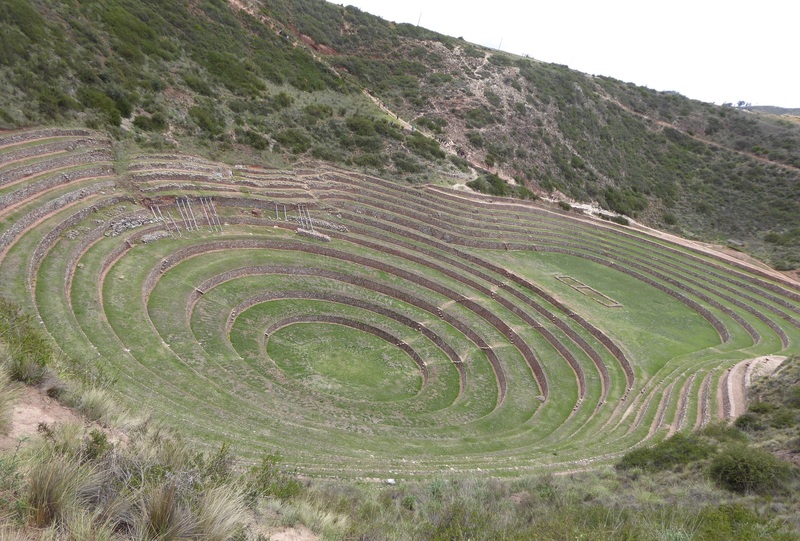 Our first stop was to be Moray, which is thought to be an Inca agricultural site. Basically, it’s a laboratory to study different climactic conditions on crops. When I saw this, I have to admit, I was a little disappointed. I thought it would be a bit bigger. It doesn’t look much like any agricultural laboratory you’ve ever seen, no? 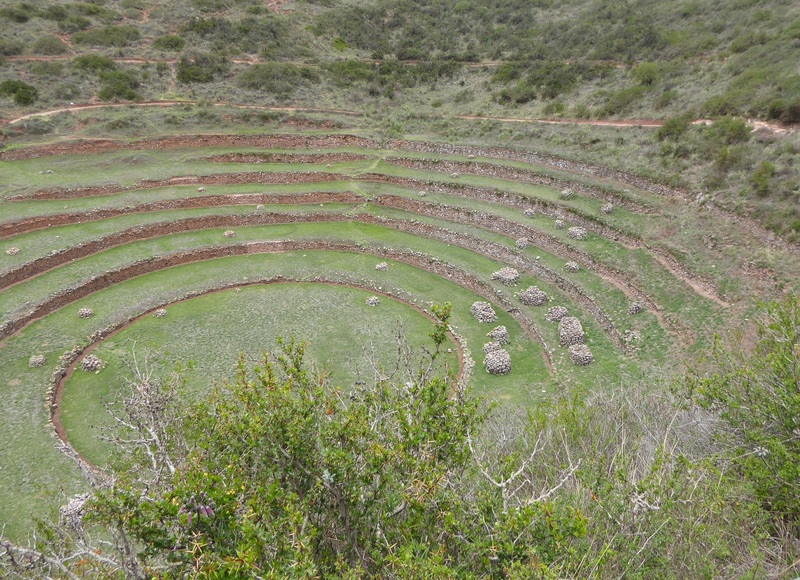 The Inca used what were huge depressions in the ground created by ancient meteor strikes (several being in the area) to construct it. Why work against nature – use what’s already there, right? This, the largest of all, is about 30 m / 98 ft deep. It’s not an absolute certainty that, indeed, this was its purpose. But, the depth and orientation to wind and sun create a temperature difference of as much as 15 °C / 27 °F from top to bottom. 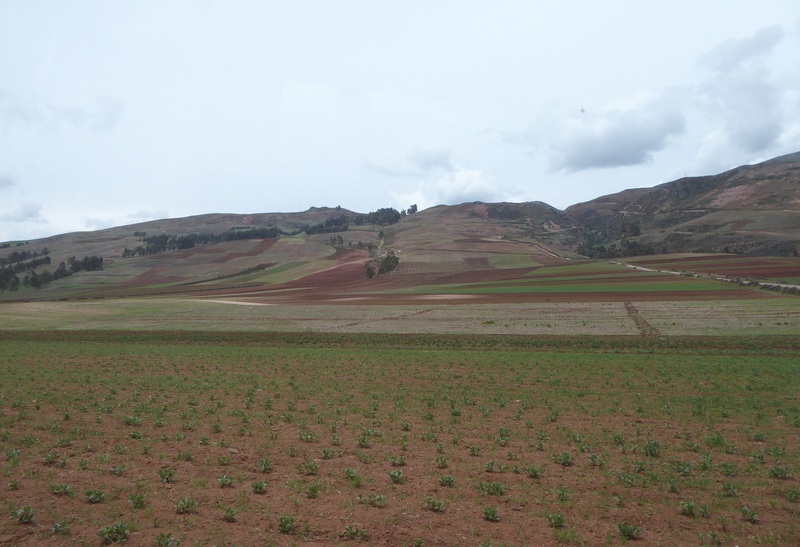 It is thought that this temperature difference was used to study the effects of climatic conditions on crops. Ingenious. There are 7 meteor depressions in the area. 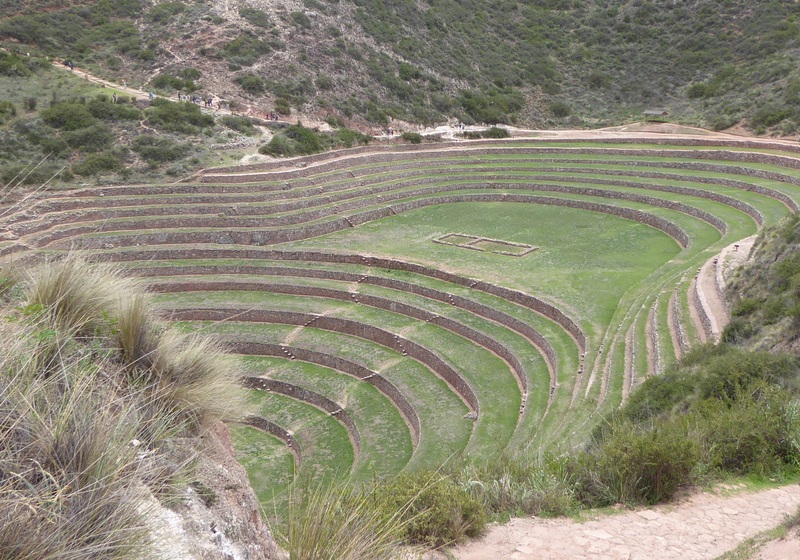 Only 4 were altered and used by the Inca. The 3 that were not altered flood in the rainy season. 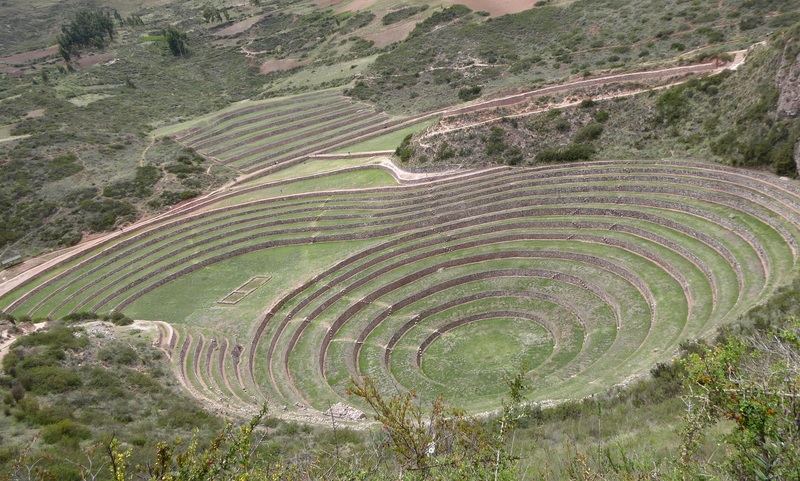 The ones the Inca did alter do not flood. 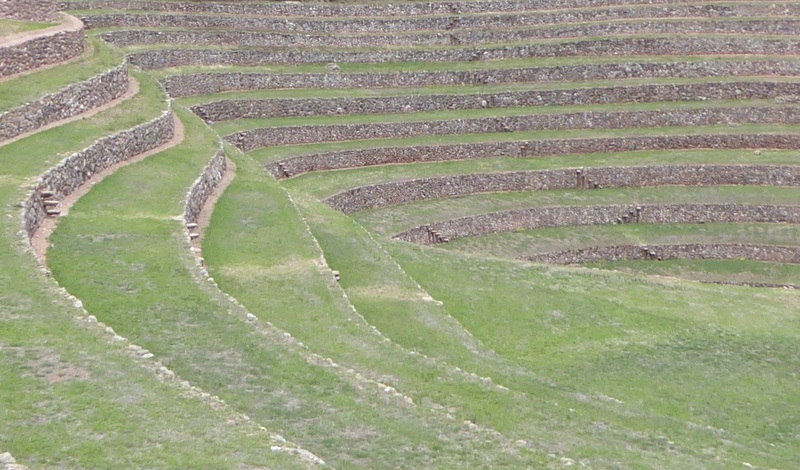 They created a drainage system for the water which flows to where it is needed for crops. It was hard to get the whole thing in one shot. This was the best I could do. I just like this shot with the blue agave in front. Now, for the main reason I wanted to go on these tours. If I could do no other part of the ‘package deal’ (so to speak), this is the one place that intrigued me most. The Salineras. These first two shots were taken from the bus window. The bus being right at the edge of the road – no room for error here! 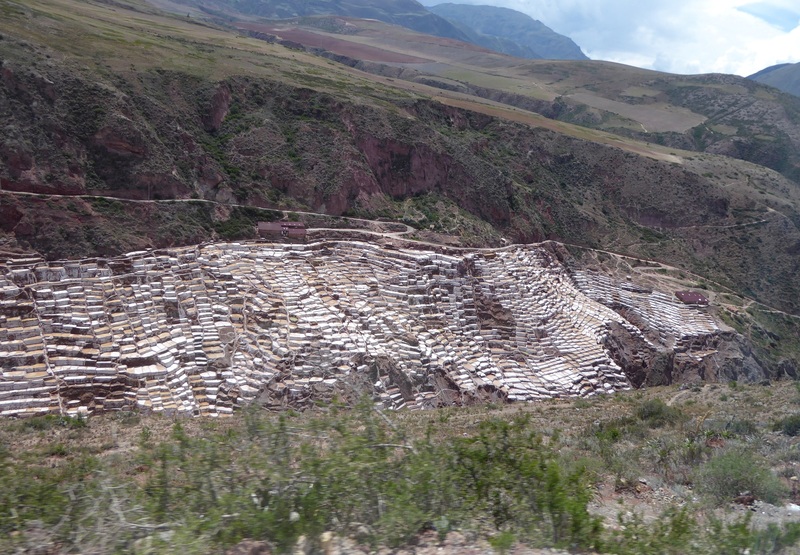 Okay, a little geologic history here. 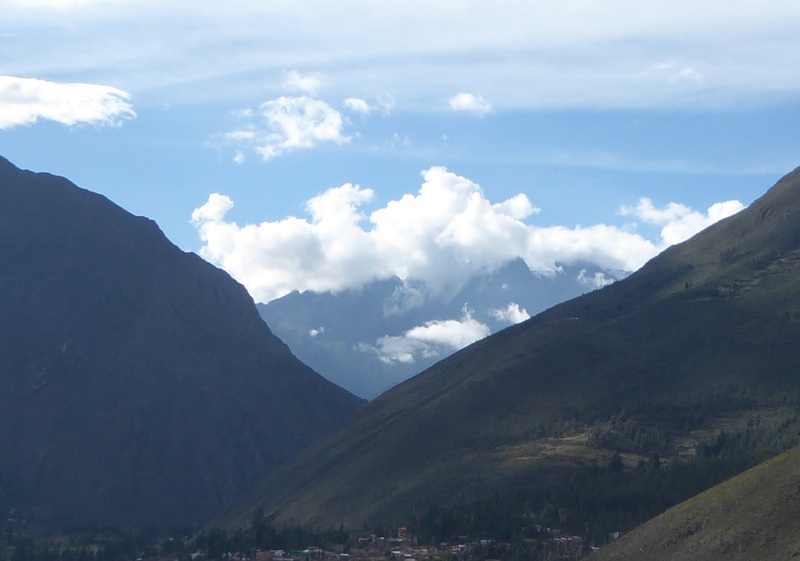 The Andes were formed by tectonic plate activity. In this case, subduction, whereby the continental plate is uplifted as the oceanic plate subducts under it. 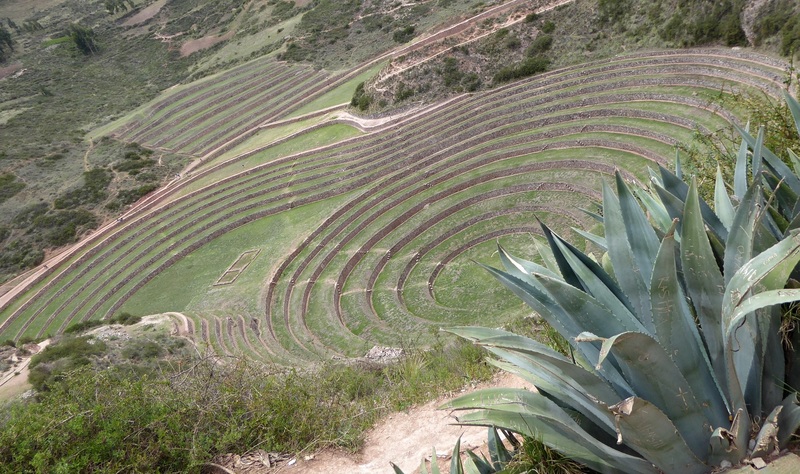 It is believed that millions of years ago (possibly as much as 100,000,000 years) an ocean covered much of Peru. 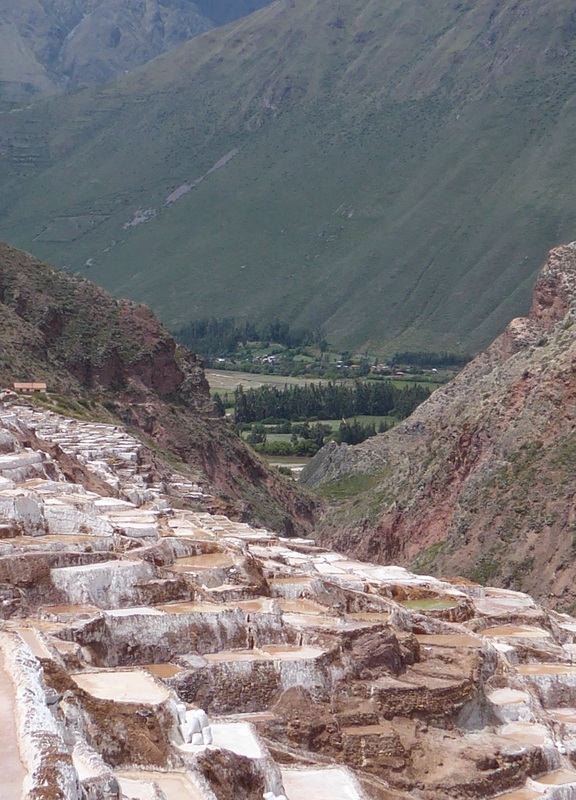 Due to the plate activity and the rising up of the Andes, much of the inland sea water was trapped. 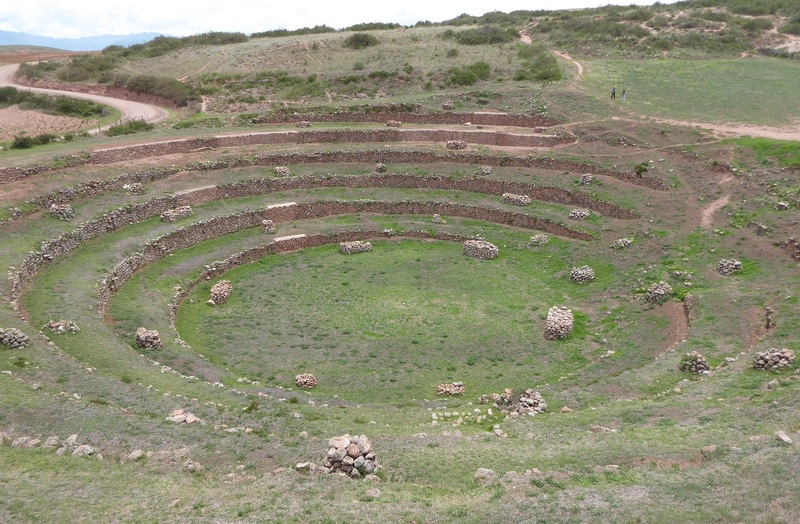 Over time this water flowed into aquifer-like pools underground which now flow above ground as springs. 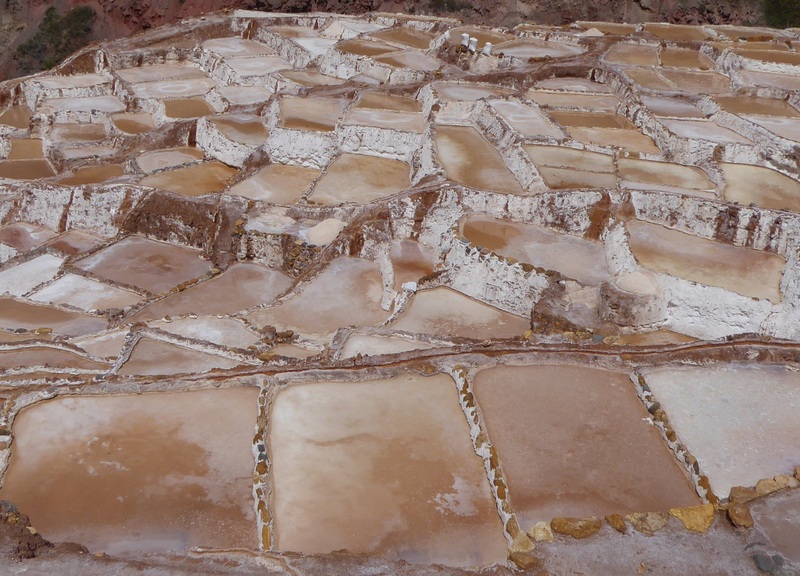 Our guide told us there are approximately 4,000 salt pans, but looking it up online, I found there are not quite 3,000. Whatever. There are a lot. This is the spring that feeds the pools. It’s pretty tiny, comparatively. 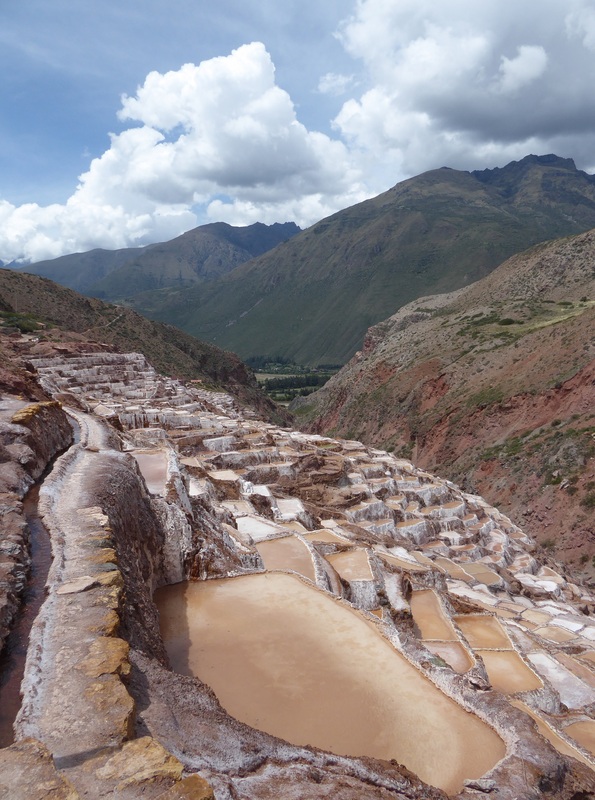 The guide suggested to taste it – indeed, salty! 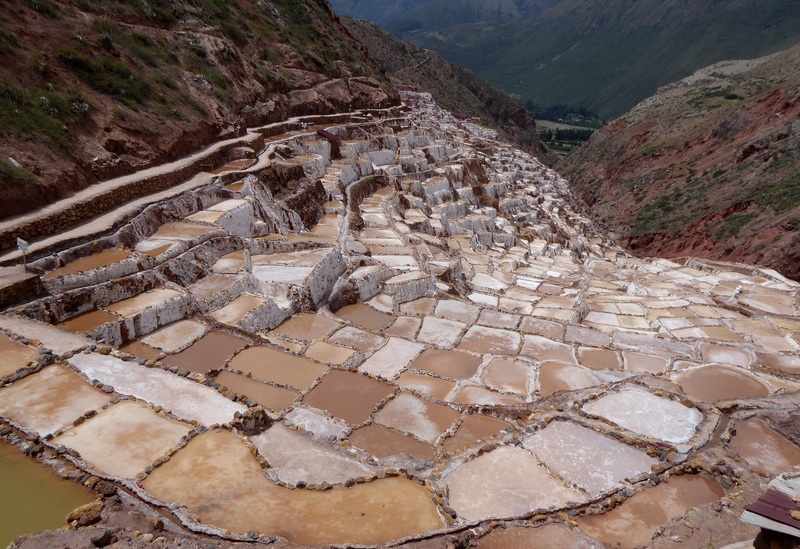 These shallow pools, or salt pans, are believed to have been developed in pre-Incan times and have been in continuous use. Here I’m standing on one of the narrow walkways between the pools. 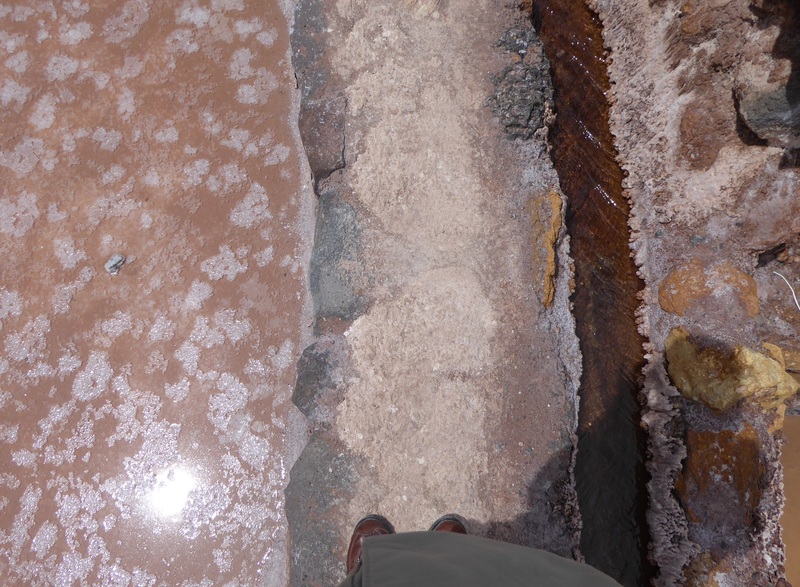 You can see on the left the salt crystals starting to form. Being the beginning of rainy season, evaporation is slow. Harvesting activity will begin in earnest in May. 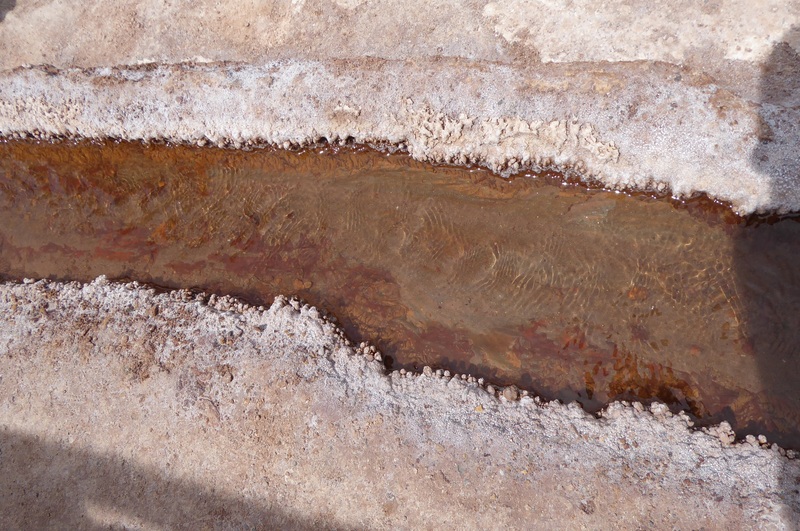 Salty spring water (slightly warm, too) flowing into the pools. 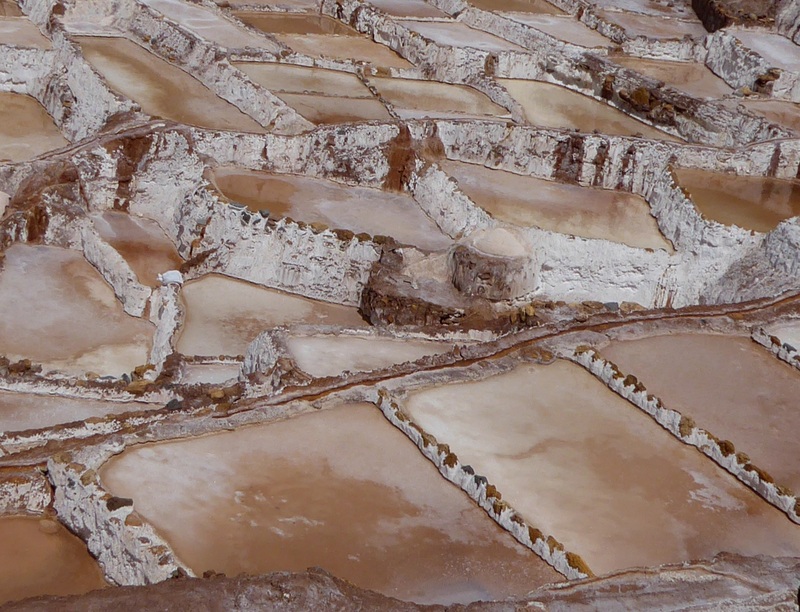 See the salt crystals encrusted on the sides? 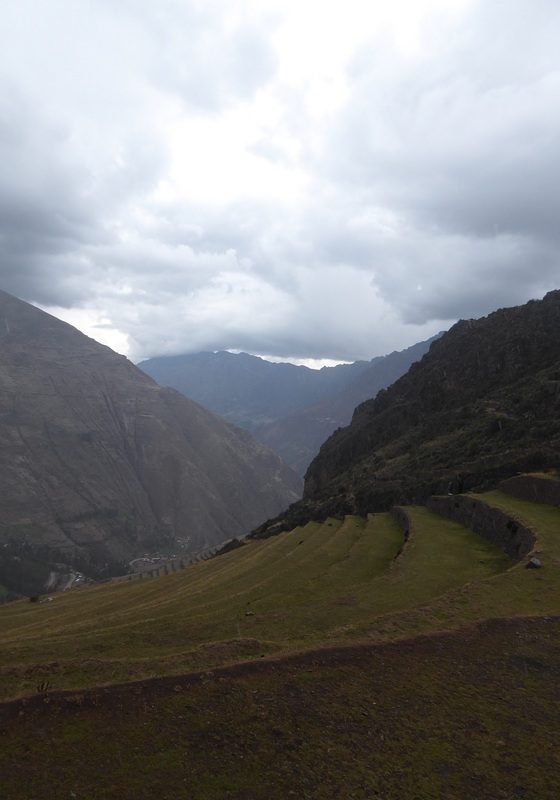 That’s Sacred Valley off in the distance. 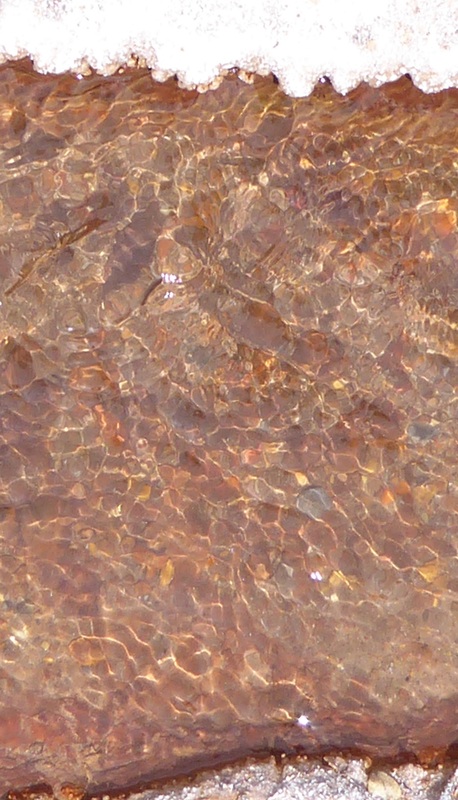 Beautifully colored rock seen through the flowing water. 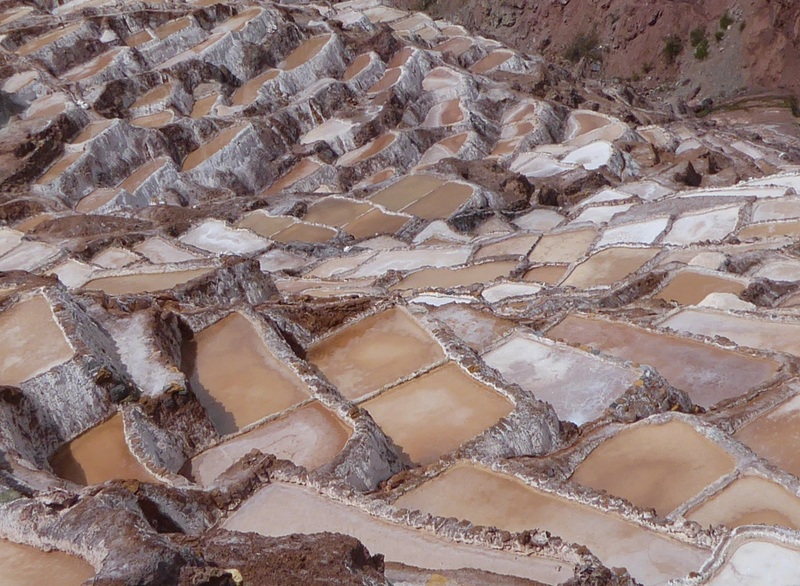 There are 3 different grades of salt that are harvested. This is the lowest grade, used for industrial purposes. Then, there’s just plain table salt. 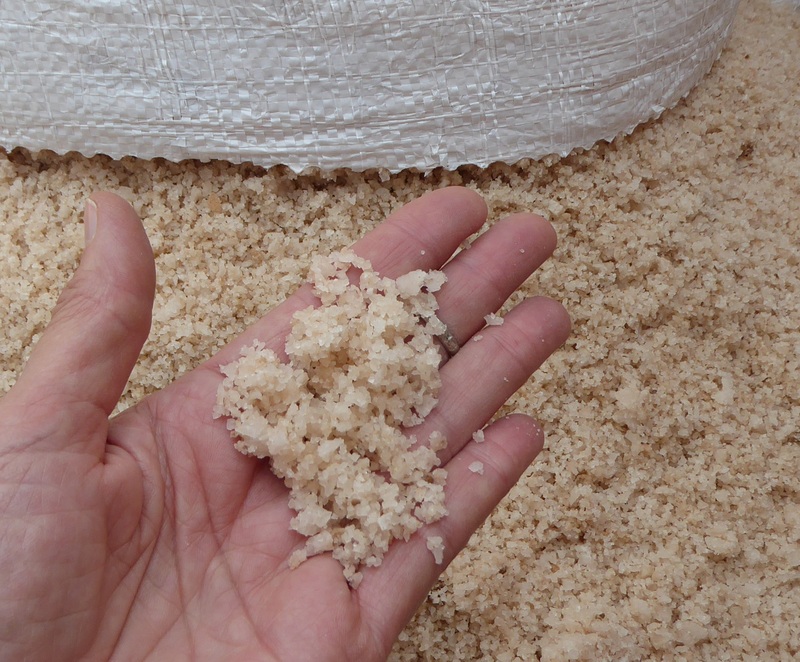 The finest is called salt flour – it’s that fine! After all that salt, I thought you’d like a photo from a nearby garden. A very busy couple of days, but still thoroughly enjoyable, multiple craft market stops notwithstanding. 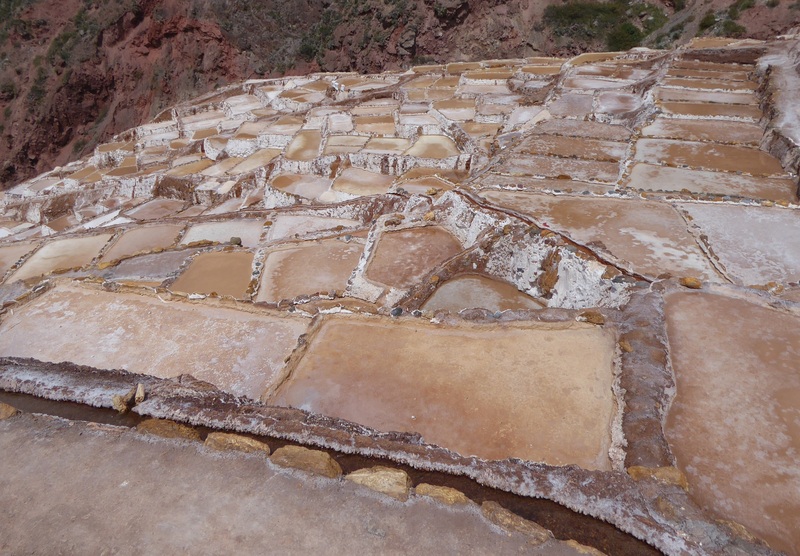 The structures and the form of the agricultural site and the salt pond are amazing. 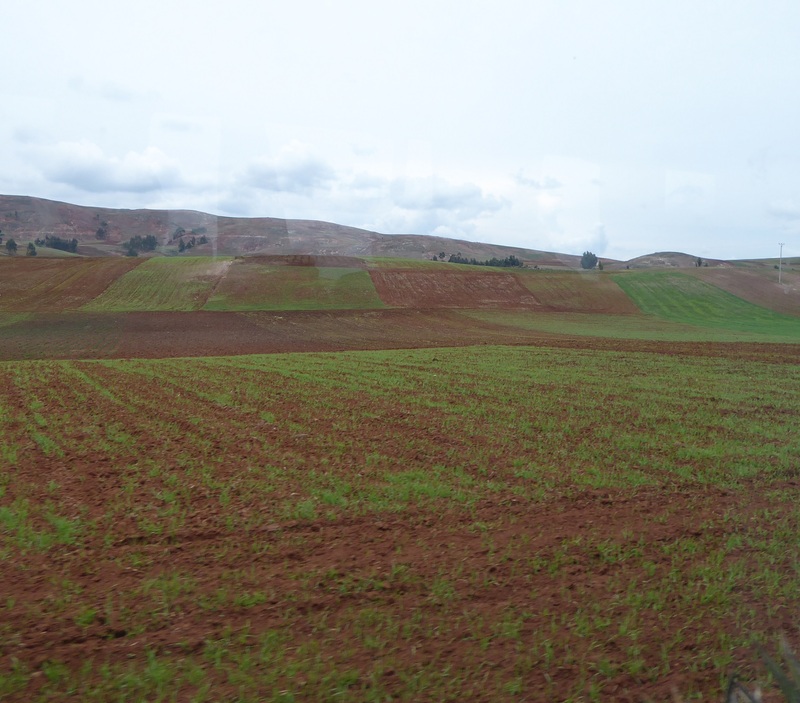 The formation of agricultural site looks so exact. My thoughts exactly about the agricultural site. 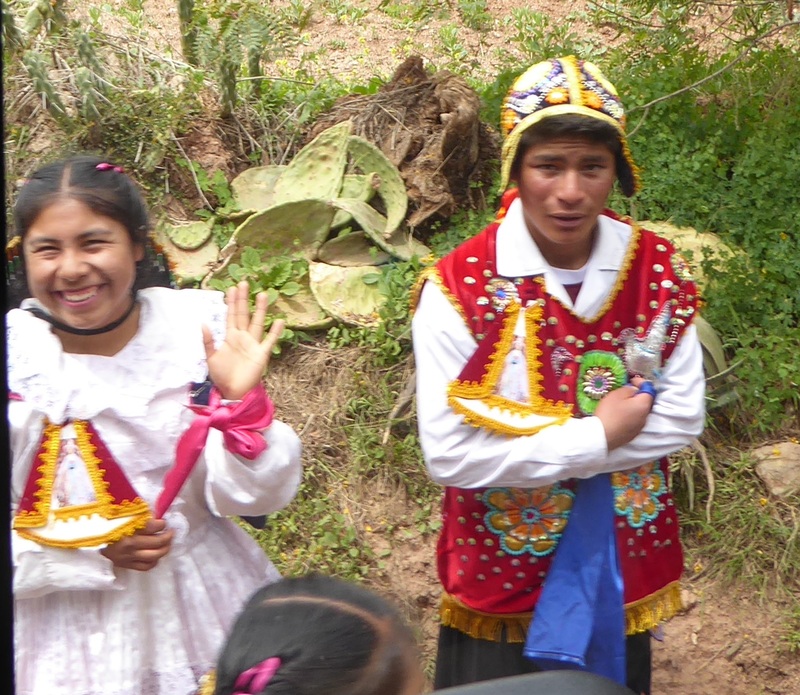 Another aspect of Inca genius! It’s my dream to go to Pamukkale…. and pretty much everywhere else in Turkey! 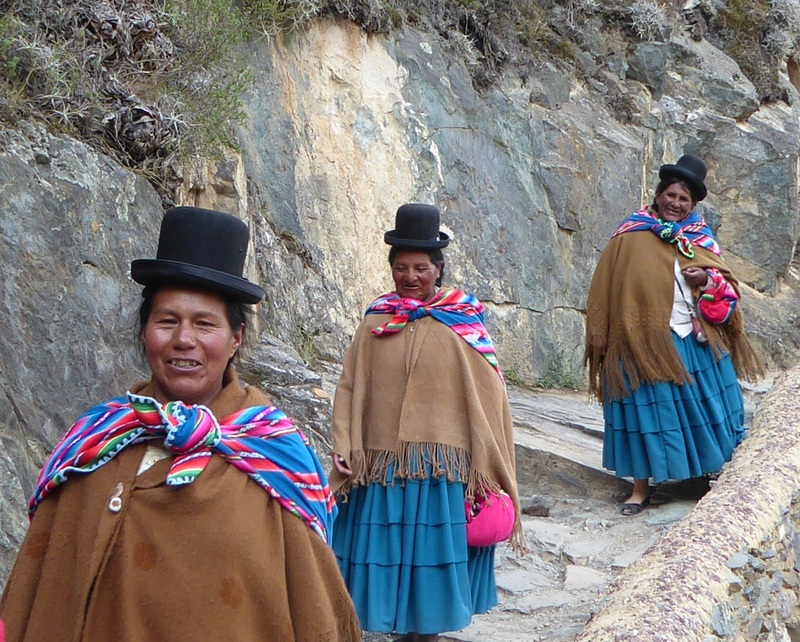 Your photos of Peru are absolutely beautiful. I’m am so excited to see the countries through your eyes!